I love iced tea. Growing up in the South, iced tea has traditionally meant black Lipton tea brewed hot in giant pitchers and mixed with copious amounts of sugar. As I've grown older, though, I've lost my taste for sweetened tea, and have begun experimenting with different brewing methods and varieties of tea leaves. In this thread I'll write a bit about my experiences experimenting with iced tea over the years. 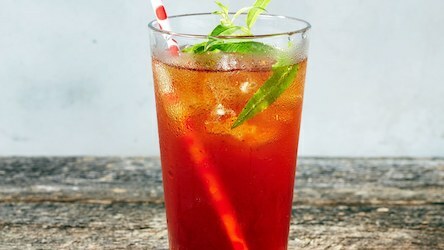 This is the iced tea recipe I have always used. Feel free to give it a shot. Put the tea and mint into the cheesecloth pouch. Put the pouch into your tea pitcher. Boil the water in a big pot. Pour the water into your tea pitcher. Allow to steep for up to ninety minutes; usually one hour is fine. Using a long spoon or some such utensil, remove the cheesecloth pouch from the pitcher. If any tea leaves escape from the pouch in the course of brewing, that's OK; you'll just need to strain the tea as this point. To do this, get a container large enough to hold the tea, along with a mesh strainer. Get a paper towel, moisten it, and line the strainer with it; then, pour the tea through the strainer into the container. Throw away the paper towel and pour the tea back into your pitcher. Keep your tea in the fridge. Recently I've been experimenting with cold-brew tea. Instead of pouring hot water over tea leaves and steeping for an hour, you put tea leaves into room-temperature water and leave them for a much longer period of time, then strain them out. This obviates the need for a giant pot, which is helpful, and can also result in tea that's a little smoother. I tried it with Lipton and wasn't happy with the flavor, but it worked nicely with hojicha. Try finding a nice peach-flavoured white tea and cold-brewing that, it's my personal favourite. I tend to take a Thermos of cold-brewed unsweetened tea to work everyday. Hmm. Good idea; I will try that. I found some at Adagio and will report back when it arrives.